The Abyss is an endless expanse of darkness. Once The Four Kings are defeated, a bonfire will appear, and, if you haven't placed the Lordvessel yet, Darkstalker Kaathe. One way entrance from New Londo Ruins. NPC teleport to and from Firelink Altar via Darkstalker Kaathe. This endless area of total blackness is just a stage for the fight against The Four Kings and does not contain anything important. 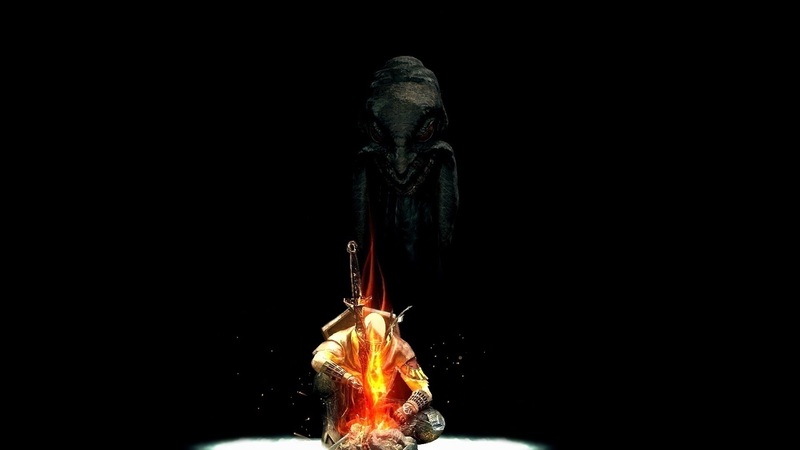 Once you have defeated the kings, you'll find a bonfire here and Darkstalker Kaathe will appear, as long as you haven't placed the Lordvessel yet. When the bonfire appears, it would seem as if the camera is constantly going slightly to the left whenever you move. You must have the Covenant of Artorias ring equipped to walk here when you want to fight The Four Kings. Otherwise you'll sink into the Abyss when you drop down, resulting in death and the message "You were taken by the Abyss" upon respawning at the bonfire. You may not remove the ring until The Four Kings have been defeated. Once the kings have been defeated and the bonfire appears, equipping the Covenant of Artorias is no longer necessary. You can then safely drop down and walk there without having to equip that ring. Since this is not really an area, but rather an endless expanse for the fight against The Four Kings, refer to their article for more info. After they're defeated, a bonfire will appear, allowing you to teleport back to different areas. Teleporting from this bonfire does not require the lordvessel. If you haven't placed the Lordvessel yet, Darkstalker Kaathe will appear in here, allowing you to join the Darkwraith covenant and also can teleport you to / back from the Firelink Altar.